Nucleus is the controlling centre where the master molecule DNA directs the entire activity of the cell. It consists of a nuclear membrane or envelope with pores, the nuclear sap or nucleoplasm, chromatin fibers (DNA) and nucleolus. Nuclear membrane: is double layered membrane. Outer membrane resembles the membrane of ER and is in continuous connection with rough endoplasmic reticulam. Outer membrane is studded with ribosomes that are engaged in protein synthesis. Inner membrane has attaching sites for nuclear lamina, the protein meshwork made up of intermediate filaments. Nuclear lamins regulate the movement of chromosomes during division. The space between the outer and inner membrane is the peri nuclear space which is a fluid filled compartment that is in continuity with ER lumen. Nuclear membrane prevents the entry of active ribosomes into the nucleus. What are the molecules that are transported across the nuclear membrane? Nuclear lamina, what is it? Nuclear lamina is the protein meshwork made of intermediate filaments (IFs) that lines the inners surface of nuclear inner membrane except the areas of nuclear pores. Nuclear lamina is a very dynamic structure. During mitosis, phosphorylation of serine residues on lamins causes the lamina to disassemble reversibly and lamin A and C become soluble and disassembles during early stages of mitosis. At telophase, they become dephosphorylated again and polymerize around chromatin. On the other hand, lamin B remains associated with membrane vescicles during early stages of mitosis and these vesicles seems to be a part in the reformation of nuclear membrane during telophase. Functions of lamins: chromatin condensation and formation of interphase nuclei. How nucleus maintains its connection with cytoplasm? As nucleus is the region where genetic material is residing, there will be a continuous movement of diverse biomolecules to and from nucleus. That traffic must be high. For the communication, nuclear membrane has perforations or pores called nuclear pores. Structure of nuclear pore complex? Nuclear pore complex has an ~size of 50-100 million daltons. Nuclear pore complex of course is a complex structure. Two rings, an outer cytoplasmic ring with particles (inactive ribosomes) and inner nuclear ring. The central ‘hole’ or the pore of the pore complex has water channels through which water soluble molecules are transported between the nucleus and the cytoplasm. This hole is often plugged by a central plug that regulates the to and fro movements. This is connected to the rings by radial spokes. Pore complex breaks the nuclear envelope lipid bi-layer continuity. 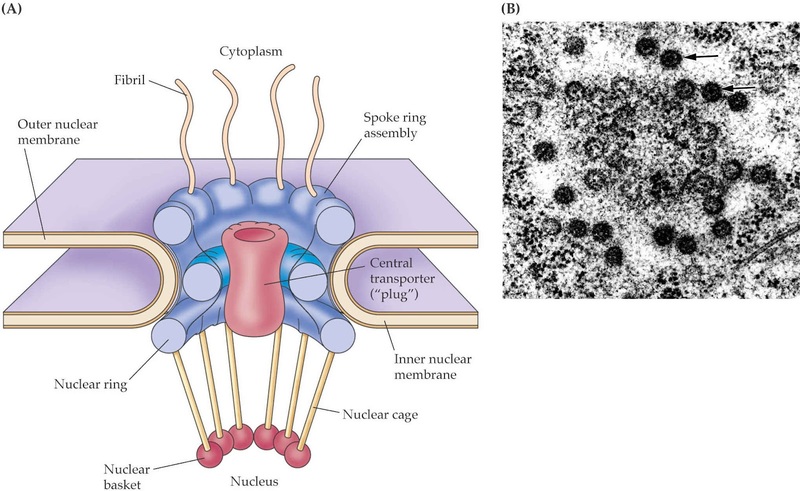 How the nuclear pores are arranged on the nuclear envelope? In majority of somatic cells, the nuclear pores are randomly distributed over the surface of nuclear membrane. Specific arrangement or packing is noticed in some cell types, rows in Eqisetum spores, clusters in oocytes of Xenopus laevis, hexagonal in malphigian tubules of grass hoppers. Pore density or no. of pores? In plants, protozoa and amphibian oocytes, nuclear pores account for 20-40% of the total surface area of nuclear membrane. In mammals, it is 5-15%. Pore density is determined by the transcriptional activity of the cell. Higher the metabolic activity, the more the no. of pores or pore density will be. Are there any signals to target proteins to the nucleus? 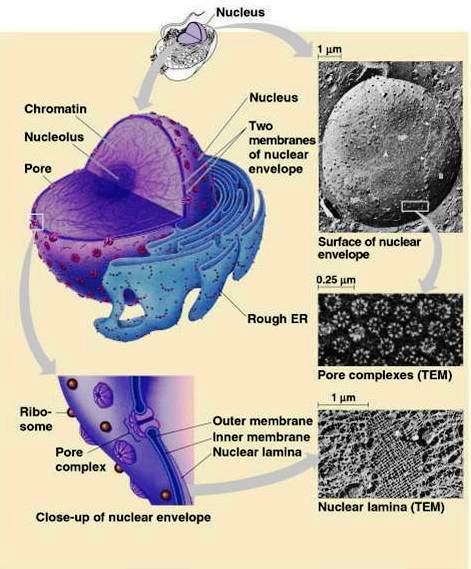 Approximately 3000-4000 nuclear pores are present in a mammalian cell. Small molecules can easily diffuse through the nuclear pore whereas large molecules requires nuclear localization signal (NLS) to pass through. NLS is 4-8 amino acids long which are rich in positively charged amino acids like lysine and arginine and generally contain proline. The proteins with NLS are taken into the nucleus by active transport (requiring ATP) without cleavage of the NLS sequence. Nuclear localization signal synonyms: karyophilic signals or nuclear import signals. Let us take the example of nucleoplasmin. Nucleoplasmins are pentameric protein with distinct head and tail domains. Nuclear specific import sequence or NLS is present in the tail domain that allows nucleoplasmins to enter and accumulate inside nucleus by active transport. Nucleus is filled with a semi-solid granular slightly acidic ground matrix called as nuclear sap. The chromatin fibres and nucleolus remain suspended in the nucleoplasm. Major component of nucleoplasm are nucleoproteins. Both nucleic acids, RNA and DNA are present in the nucleoplasm that may occur either as polymers or monomeric nucleotides. Proteins are of two types: Basic proteins like nucleoprotamines, histones and acidic proteins (non-histone proteins). Nucleoprotamines are low molecular weight proteins (MW=4000 D) which are rich in arginine. Histones are high MW proteins (10000-20000 D) primarily composed of basic amino acids such as arginine, lysine and histidine. Histones are seen associated with DNA. Why histones are rich in basic amino acids? DNA is wrapped around histone proteins. As DNA is negatively charged, positively charged amino acids or basic amino acids of histones will favour the formation of ionic bonds between them. The most abundant acidic protein in the nucleoplasm is phosphoproteins. Many enzymes required for DNA and RNA synthesis are present in nucleoplasm like DNA polymerase, RNA polymerase etc. Other constituents in the nucleoplasm include co-factors such as ATP, small amount of lipids, and minerals like phosphorous, sodium, calcium and magnesium. Chromatin fibres are coiled elongated thread like fibres visible during the interphase and can readily take up basic stains like basic fuschin. We call the same structure as chromosomes during cell division where these chromatin fibres get thickened to form a ribbon like structure. We will be discussing these terms in detail in the topic “chromosomes”. Chemically, chromatin is a nucleoprotein complex composed of DNA and proteins and very small quantity of RNA. The protein DNA ratio is 1:1. Chromatin are of 2 types: Heterochromatin and euchromatin. Heterochromatin: The deeply stained and highly condensed region of the chromatin that occurs around the nucleolus or at the periphery of the nucleus. Usually, heterochromatin is transcriptionally inactive and metabolically inert. Euchromatin is the lightly stained and diffused region of the chromatin that is transcriptionally active.